FUV Essentials, both on-air and online, celebrates the musicians who have shaped our cultural soundtrack for the past fifty years, examining their impact, influence and discography. Few American bands have balanced Southern Gothic, sun-splashed punk-pop, and bruising, abstruse rock 'n' roll more deftly than R.E.M., a quartet-turned-trio that thrived for 31 years, until its breakup in 2011. Led by cryptic frontman and lyricist Michael Stipe and propelled by the arpeggiated grit and grace of Peter Buck's guitarwork, Mike Mills's crafty basslines and Bill Berry's solid drumming (until the latter's departure in 1997), R.E.M. rose from Athens, Georgia, part of a subterranean movement of American bands that defied and then redefined the mainstream. Like their Athens peers Pylon and The B-52's, R.E.M. angled sharply to the invigorating wave of post-punk emerging from New York and Britain, but they were still influenced by folk-rock too. Oddly, the band that defined "college" or "alternative" rock during the years of their earliest releases, like 1981's game-changing single "Radio Free Europe," 1983's Murmur and 1984's Reckoning, had graduated to stadiums and arenas by the late '80s, fueled by hits like 1987's caustic "The One I Love." That song, found on an album rich with subtle shades of sociopolitical fury, Document, was a perfect example of R.E.M. 's contrary brilliance: an excoriating missive, uplifted by Buck's luminous open-string chords and Stipe's enigmatic wordplay, that was completely misconstrued to be a romantic love song. Stipe's own gender fluidity lent to the band's mystery; when he eventually became more outspoken about his queer identity in the mid-to-late '90s, it offered a window into his often hazy, inscrutable lyrics. Multi-platinum, mega albums like 1991's Out of Time and 1992's Automatic for the People vaulted R.E.M. into the top tier of rock bands, but after suffering a frightening, on-stage brain aneurysm in 1995, Berry, who was also the band's first manager, reevaluated his life and retreated to his Georgia farm, leaving R.E.M. in 1997. With Berry's urging, Stipe, Buck and Mills continued as a trio. The transition was not easy: during contentious recording sessions for 1998's Up, the three musicians nearly split for good. But recruiting touring and recording cohorts, like drummer Joey Waronker and Minus 5 guitarist Scott McCaughey, helped R.E.M. find a certain equilibrium, if not quite peace, and they continued to release albums, like 2001's dreamier Reveal and 2004's Around the Sun. Although the rigorous, punk-lashed power of 2008's Accelerate, a collection of songs pushed into a more muscular direction by Buck, marked a high point in the band's latter years, it wasn't enough to sustain R.E.M. 's desire to continue as a band. After the release of the group's fifteenth album, 2011's Collapse into Now, R.E.M. took the album's title to heart and promptly collapsed, announcing their breakup in September 2011. Post-R.E.M., Buck has worked with McCaughey and Gary Lightbody in Tired Pony and he, Mills—and McCaughey too—are also a part of The Baseball Project (yes, songs about baseball). Mills will play the White House Correspondents Jam on April 29 as part of a "supergroup" called Phil and the Busters with Rolling Stones keyboardist Chuck Leavell, Widespread Panic's John Bell and Marshall Tucker Band drummer Paul Riddle. Over the years, the reclusive (and now very bearded) Stipe has duetted with everyone from Chris Martin to Neneh Cherry, and in 2016 has begun to perform live as a solo artist, notably covering David Bowie songs on "The Tonight Show Starring Jimmy Fallon" and at two Bowie tribute shows in New York. In a month that marks the 36th anniversary of R.E.M. 's debut show at an old church, on April 5, 1980 (they played the former Coffee Club 11:11 in Athens on April 19, 1980), FUV celebrates this essential American band that has since inspired thousands of music critics to forever reach for the term "jangly guitar" whenever describing R.E.M. 's beautiful noise. FUV's New Media director Laura Fedele on R.E.M. 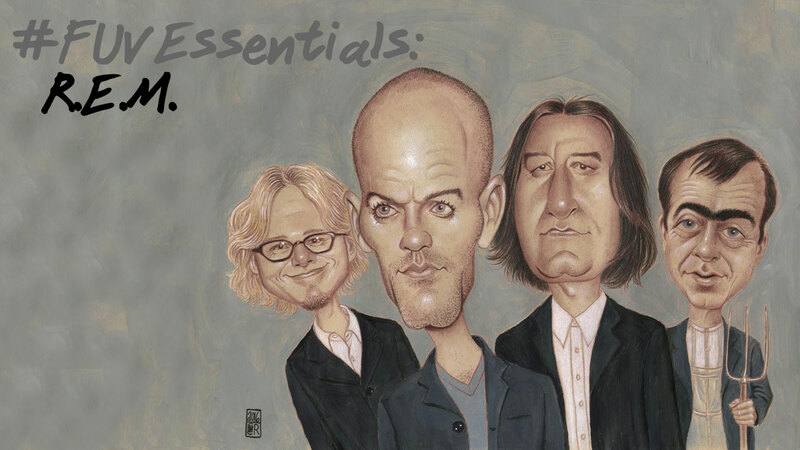 FUV Essentials FUV Essentials R.E.M.